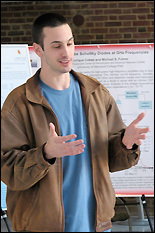 Graduate student Chris Long presenting his work at the 2009 ResearchFest. Graduate student Christian Long, advised by Department of Materials Science and Engineering associate professor Ichiro Takeuchi, was one of ten students nationwide selected for a 2009 Ludo Frevel Crystallography Scholarship Award. The award, granted by the International Centre for Diffraction Data (ICDD), is designed to support the graduate students conducting research in crystallography-related fields. Long won for his proposal titled "Rapid Identification of Structural Phases in Combinatorial Thin-Film Libraries Using X-Ray Diffraction and Non-Negative Matrix Factorization." This marks the third time Long and the Takeuchi Group have won an award for their work on data mining of combinatorial x-ray data. In 2005 and 2006 Long won a Bruker AXS Excellence in X-ray Diffraction scholarship. This work has been supported by NSF International Materials Institute on COSMIC, NSF MRSEC at UMD, ONR MURI on magnetostrictive materials, and NIST.